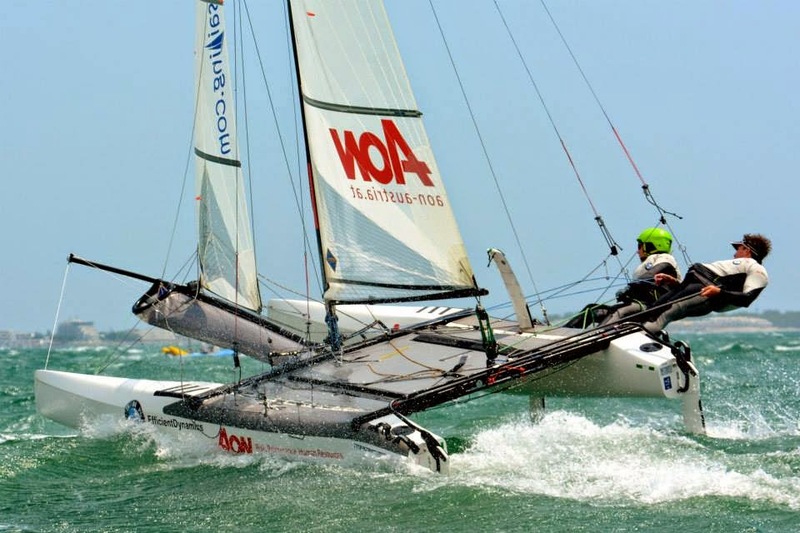 Who will win the Nacra 17 European Championships? Even on the brief evidence of the windy official practice races for the Nacra 17 European Championships Australia’s Olympic silver medal winning pair Darren Bundock and Nina Curtis are certainly among the favourites, even if they are not eligible for the European title. In a muscular 20-22kts breeze they immediately lead around the windward mark from the first start, doing enough to show they feel completely at home in the stronger breezes on this stretch of the Mediterranean. The quality in the fleet is pretty much second to none in Olympic sailing at the moment. Among the past medal winners are Greece’s Sofia Bekatorou (one gold, one bronze), Spain’s Iker Martinez (one gold, one silver), Bundock (two silvers), Argentina’s Santiago Lange (two bronze), Pippa Wilson (one gold), the Netherlands Mandy Mulder (one silver), Curtis (one silver), Whittey (one silver) and Denmark’s Allan Norregaard (one bronze). “ I don’t think about if we can win here or not, we just try to sail well and make no mistakes and the results will come. We worked a lot together and so now we hardly need to talk. The level of the fleet is very high and of course we have non Europeans here too and they are very good. The world number 1 is just a number, it means nothing to us. Looking at the entry list it looks really good, with some great sailors here. But on the water everyone is the same, it does not matter if it is Bundock or anyone, on the water we just want to beat them. Today we'll go on the water, sail for a couple of hours, do some practice racing and try and get ready for the racing and learn as much as we can. Meantime the strong French group, who are actually on their home, training waters off La Grande Motte finished their final session, among them world champions Billy Besson and Marie Rioux, Volvo Ocean Race and Little America’s Cup winner Franck Cammas with Sophie de Turckheim, and Italy’s world ranked number one pairing of Vittorio Bissaro and Silvia Sicouri arrive in La Grande Motte after winning the class in Kiel and Hyeres. “All the good teams are here, I think the French will be very strong Billy Besson and Marie Riou plus the Spanish Iker Martinez will be very strong as well and hopefully we will be up there as well. To say who will win at this stage is a very difficult question. I think a little bit depends on the weather.” Cautioned double Olympic silver winner Bundock. The Australian pairings include Curtis, who won silver in 2012 in the women’s match race along with Lucinda Whittey. Whittey sails with Euan McNicol who coached the trio to silver in the Women’s Match Racing in 2012. Most of the fleet have their eyes looking forwards to the ISAF World Championships in Santander, Spain in September, an essential selection and funding marker for many crews as well as a sought after title, and these Europeans Championships are also an important top level racing opportunity along the road. And within the European Championships fleet there is such a broad mix of sailors following some diverse options at the moment. Cammas arrived back today direct from the start of La Tour de France a la Voile where his Groupama M34 programme will race without him until the Mediterranean. Racing starts Monday with the 71 boat fleet representing 28 different nations, running in two fleets through qualification, then gold and silver fleets to a medal race next Saturday. Ben Saxton, GBR: “ This is a new place I've never been here before but I've heard of it before so its really nice to be here. It’s fun to be somewhere new and the sun is out so we're happy. Our goal is to sail well, we're really building up to the world championships which is in about a month so right now all we want to do is sail well. “ There's a big bunch, there’s probably ten boats - ten, fifteen boats- that are really quite good so all of us have got it all to play for. There's no, nobody is a long way ahead and also nobody is a long way behind so its all really close. I sailed 470's for three or four years and then I’ve sailed the Nacra for a year and a half now. Before that I hadn't sailed the catamarans but I had done a lot of sailing in all boats, yachts, dinghies, big things, small things. My crew, Hannah Diamond, she had done Laser Radials for a bit, I sailed against her in Optimist and then she did Laser Radials then she stopped sailing for two years during university. Then she was just starting to sail the 49er FX, did that for a couple of months then I said no come sailing with me. Strong points? I think we're quite quick which makes the racing a lot easier. The weaknesses are that we are still learning a lot about catamarans but that’s nothing bad, theres a long time to go and everyone has weaknesses. Why are we quick? That’s the million dollar question, I dont know why. I dont know we just are. We have actually we got in the boat about a month after the other British guys and were close to them, not too far behind them immediately and now there are three or four of us Great British guys who are all really similar but we seem to be quite quick. We don't have a really bad wind, which makes us on average quite quick because some people really struggle when it's really light or really windy. In the winter we were over in Faro, Portugal because that’s as warm as we could find without it being really far from England. Billy Besson (FRA), World Champion title with Marie Riou: "We are really very proud to be having this great event here in France, and in particular in La Grande Motte. We have trained many times here with the Nacra and I spent six months here last year with the Hydros project. We're really happy to be here, it’s a great place and it should be a great week.